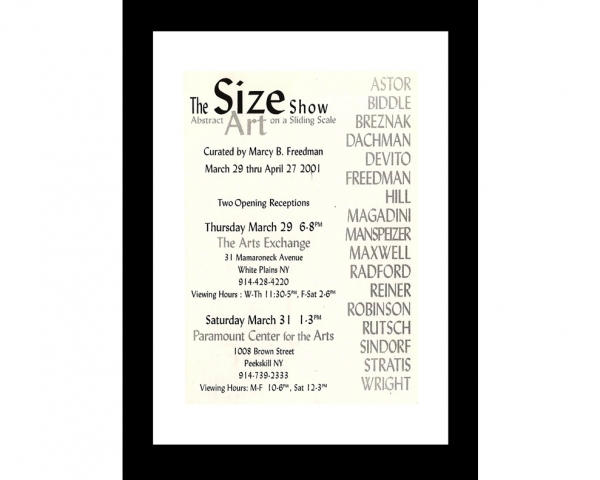 I had the opportunity to curate a two-part exhibition called The Size Show: Abstract Art on a Sliding Scale. One venue, the Arts Exchange in White Plains, could accommodate medium and very large works. The other venue, The Upper Gallery at the Paramount Center for the Arts, was appropriate for very small and medium works. My goal was to explore the ways in which the scale of an artist’s work might impact our experience as viewers. Towards this end, I asked each of the selected artists to exhibit two works of differing sizes. In the end, I was surprised to discover that size matters, a lot! I felt strongly that certain artists were not capable of translating their style from one size to another! Live and learn.